Different operating systems like Linux and Windows have different text file formats which are not compatible with each other. While using these platforms to edit and read text file there will be problems. 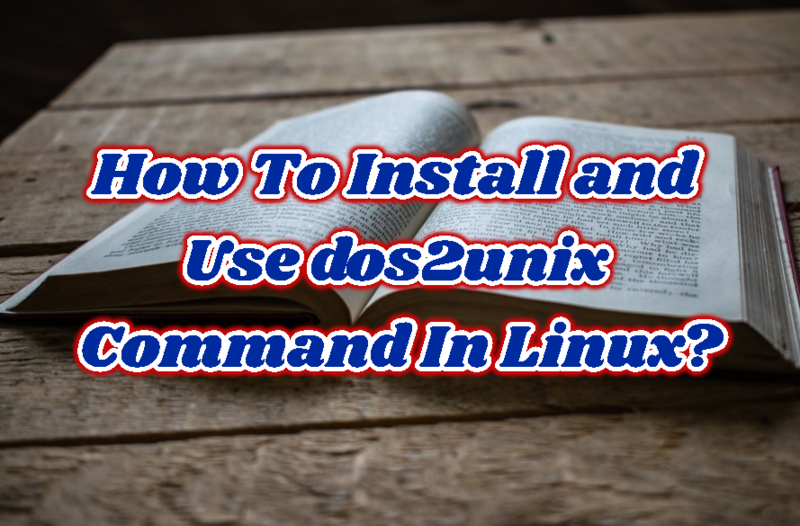 If we want to use a text file which is created or edited in Windows or MS-DOS environment in Linux we need to change the text file into Linux format with the dos2unix tool. As dos2unix tool is a very simple tool we can install it for different Linux distributions like below easily. We will use apt command and dos2unix package name for installation. We will use dnf command like below. As stated previously there are some characters which are not used in Linux text files but used in Windows text files. End of line is specified with Carriage Return CR followed by Line Feed LF in Windows but In Linux, only Line Feed LF is used. We will start by listing or printing the given file encoding type and line terminator type. We will use the Linux file command which provides this information. We can see that the file a.txt is encoded with the ISO-8859 and have CRLF or Windows line terminators. We will start with a simple example where we will convert the file which is created in the Windows or MS-DOS environment named a.txt into a file which will be used in the Linux environment. a.txt will be converted as the same file name. After checking with the file command we can see that it is referred to as text file without CRLF line terminator. While converting there are different conversion modes which provide alternative about the conversion. We can use the following options and conversion modes. In this example, we will convert to ASCII format with the -iso option. We can see that detailed information is provided during conversion. Timestamps are file attributes those holds information like creation time, modification time, access time etc. While converting a text file from DOS format to Linux format this information will be changed. We can preserve the time stamp information with the -k option like below. Up to now we have converted files and replaced. We can specify a new file name where the converted file content will be written to this new file and old file will be kept without a change. We will use -o option and specify the new file name. In this example, we will create the newly converted file name b.txt. If there are a lot of files to be converted to Unix or Linux text file format converting them one by one is trivial work. We need to run the bulk operation on all files. We can use find command which will execute given dos2unix command on all found files which are specified as txt. In this example, we will find all text files which is specified with -name *.txt in the current working directory which are specified with . and then run dos2unix command all of these files with the xargs command. LEARN MORE What Does CMD /C Means In Windows MS-DOS Command-line Tutorial with Examples?